The sun-like intensity of the giant, lit up KISS letters caused me to look away, even though I didn’t want to. And when I blinked the letters remained burned into the insides of my eyelids. I can instantly recall the musty smell and taste of 20,000 people and the smoke and sweat that came from our mouths and bodies on the muggy July night. The volume of the band was sometimes dwarfed by that of the crowd, and my chest and feet rumbled. I felt at once overwhelmed, frightened and ecstatic. My mother loved the show, too, but she feared for our safety, insisting that we wear the cheap plastic baseball helmets she’d bought outside the show to shield ourselves against fan-tossed fireworks. My mother and I both live in New York City, and the present-day version of our camaraderie exists when she takes me to Broadway shows. We’ve recently seen A Chorus Line and On The Town. She bought our Hamilton tickets months before it opened, claiming, “It’s going to be a big one.” No Broadway show has come without a series of questions and demands from my mother: Can we get an aisle seat in the back row? Which date will be the least crowded? But when I texted her my invitation to see Kiss, she didn’t ask about dates or seating options. Her one-word reply read simply, YES! My mother raised me on her own. We bonded over seeing live music and constantly listening to music in our apartment, where John Coltrane, Donovan, Patti LaBelle, The Beatles, Stevie Wonder and Judy Collins provided an eclectic soundtrack. I’d started playing drums at age two, when my uncle bought me a drum set, and for as far back as I can remember, I wanted to be in a band. But as a racially-mixed kid, I didn’t identify with most of the musicians I saw or listened to. Even though I was exposed to a good balance of black and white artists, I didn’t look like anyone whose picture appeared on the albums we owned. The Beatles had pale skin and straight, brown hair that I knew I wasn’t capable of growing. John Coltrane was a much darker shade of brown than I was, and his afro was tighter than mine. I knew I was somewhere in between these people, with no one to directly emulate. I couldn’t change who I was, nor did I want to, but something about the four men in Kiss felt oddly attainable. I had no idea what they looked like in real life, and for that reason, there was nothing that stopped me from looking like them. 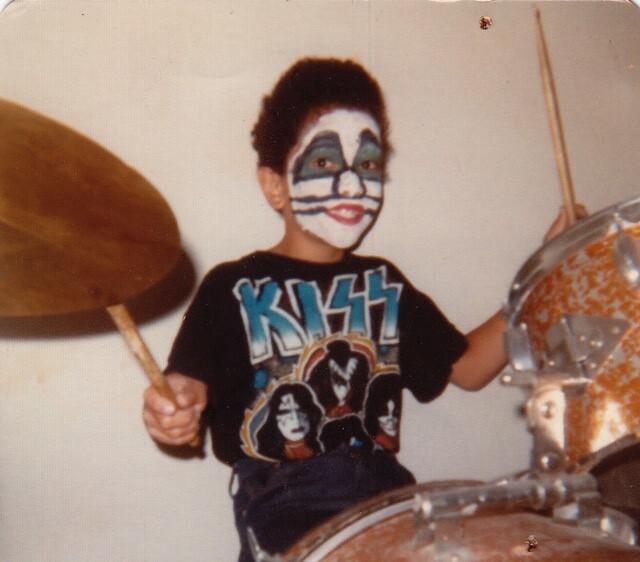 One Halloween I went as the drummer, Peter Criss. My official Kiss costume, purchased at the drugstore with saved up allowance money, was an abrasive mask that smelled of toxic paint and displayed a stark white face with black whiskers protruding from its mouth. While the face was spot-on, the hair felt like an afterthought; limp, frizzy yarn barely clung to the plastic mask, offering no assurance it would last through a full Halloween. My mother and I thought we could do better, which meant that I’d remove the mattress from my wooden bed frame and replace it with my drum set, transforming it into a drum riser. It wasn’t as tall as Peter’s, which towered above the stage in the explosive, war-like photo inside Kiss Alive II’s gatefold album jacket. But it sufficed in our tiny apartment. To complete my transformation, my mother painted my face like Peter’s. After she applied a layer of white face paint, I felt unable to form any facial expression, my pores sealed with thick, white goop. How do they do this every night, I wondered, as my mother carefully applied my green and black eye makeup. When she finished my red lips, I put on my Kiss t-shirt, sat at my drums and blasted Destroyer at a volume that made our speakers sizzle with distortion. “You look just like Peter Criss!” my mother exclaimed proudly. Forty years after the first time we saw KISS, my mother and I will take the subway to the same venue. When the lights go down and the crowd noise intensifies, my stomach will recall the excitement of a seven-year-old at his first arena concert. We’ll take photos with our phones and sit comfortably without fear of fireworks hitting us. We’ll watch the band on larger-than-life screens with no smoke to obscure our view. My mother will remind me that as a child, I used to air-drum at concerts, and she’ll point out the other mothers who are there with their sons. And I’ll remember why we’re there. Not for the music or the spectacle — neither of which will ever feel as powerful as they did in my youth — but to allow Kiss to refresh memories that only a mother and her child could create. This Kiss tour is billed as The Final Tour Ever. The band played a Farewell Tour in 2000 and 2001 but later announced that it was only a farewell to its full original lineup, making it the last tour to include drummer Peter Criss and guitarist Ace Frehley. Though I find myself listening to Kiss occasionally, I haven’t followed the band in quite some time. I know that Paul Stanley and Gene Simmons are the only remaining original members. But I have no idea who plays guitar or drums in Kiss. It could be anyone.